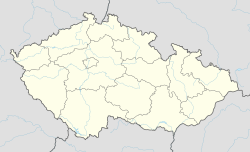 Tuchořice is a village and municipality (obec) in Louny District in the Ústí nad Labem Region of the Czech Republic. The municipality covers an area of 23.17 square kilometres (8.95 sq mi), and has a population of 699 (as at 28 August 2006). Tuchořice lies approximately 13 kilometres (8 mi) south-west of Louny, 50 km (31 mi) south-west of Ústí nad Labem, and 59 km (37 mi) west of Prague. Miocenní sladkovodní vápence natural monument is a paleontological locality near Tuchořice. Tuchořice is a paleontological site with Miocene lacustrine limestone deposits. Some 90 species of molluscs were found in this site.The majority of those species are land snails and some of them were originally described from Tuchořice. ^ (in Czech) Chlupáč I. et al. (2002). Geologická minulost České republiky. Academia, Praha, ISBN 80-200-0914-0. pages 318-319. Wikimedia Commons has media related to Tuchořice. This page was last edited on 11 July 2018, at 01:04 (UTC).